This tricycles three wheel motorcycle are used primarily by older persons for recreation, shopping, and exercise. 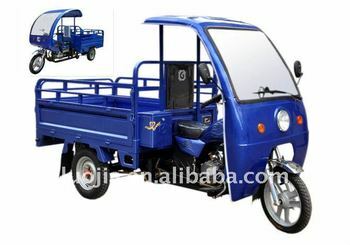 In Asia and Africa, tricycles are used primarily for commercial transportation, either of passengers in pedicabs, or of freight and deliveries. Motorized trikes can be powered with a variety of methods, including motorcycle engines, smaller automatic transmission scooter motors, and electric motors. This tricycles three wheel motorcycle are powered with motors, typically gasoline 110cc or 150cc engines. motorcycles tricycles are sat on in a "saddle"-style seating (as with a horse), with the legs apart, and motorcyles have manual transmissions.also call three wheel motorcycles. We are one of professional manufacturers in China specialized in research, manufacture and selling motorcycles,tricycles,scooters, engines and spare parts. We strictly implement the ISO9001:2000 quality management system, ISO 14001:2004 environment management system, and the state CCC certification. With 40 years experience in motorcycles manufacturing and cooperation with high quality C100-H technology, our products are both excellent in quality and reasonable in price.